← My First Liebster Award! We experience so many sensations when we visit a place. Some dazzle us with their visual appeal, some delight us with their melody, some flatter our taste buds with their strong or subtle flavours. And then there are those that refuse to leave us when we have long left the place. Today, I’m going to talk about some sensations that have attained a state of permanence in my subconscious. And most of these are deeply linked to the distinct scents they carry. The inviting aroma of warm mung dal drew me out of my room and I decided I should unpack later. Before me was a large plate full of Bengali delicacies. Food so flavourful is eaten with hand! The hot meal was spiced with asafoetida and turmeric, but there was a perfect balancing element – the sweet dish. The blood-red tomato-chutney was subtly sweet and tempered with black sesame seeds. But my favourite dish was mishti doi, the famous pink-tinted yogurt which is sweetened with khejur-gur (date-jaggery). Served in a small earthen urn, mishti doi always manages to tranquilize me with its delicate scent of succulent dates that mixes with the smell of baked earth. Kolkata feeds not just your body but also your mind. 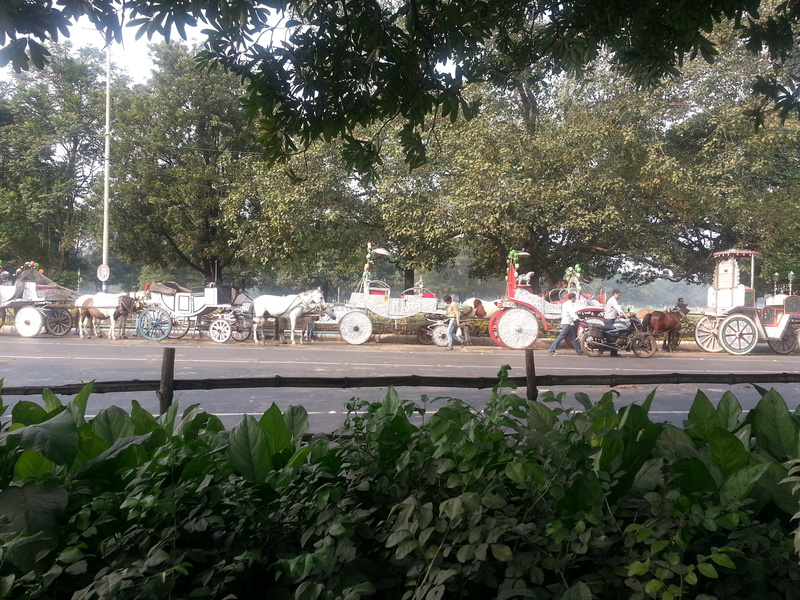 On our way to Victoria Memorial, we walked past a string of royally embellished carriages drawn by handsome Arab stallions and English thoroughbreds. I don’t know what the 18th century smelled like, but to me it smells like fresh paint blended with hay from horse stables. This unusual odour is so potent, it makes one dream of the times one only reads in History textbooks. When one thinks of the olden times, one cannot help but notice old age. 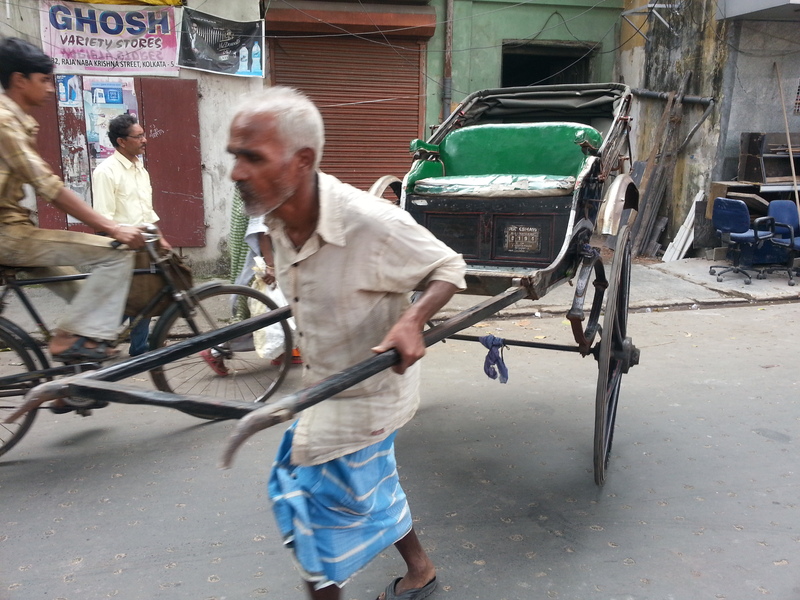 I walked around the streets to find several rickshaw pullers awaiting their customers. Quite a few amongst them were well past their middle age; their hair, a snowy shade of white; their salt-and-pepper beard, more salt and less pepper. In the damp air, I smelled their spirit and strength to carry on with work and let age only remain a number. Kolkata is full of noises – the bleat of a cycle-rickshaw horn, the holler of a bag-seller, the ringing bells of a tram, the creaking of a rickety State-bus and the constant shuffling of feet. But I found peace amidst the noise – several nuns (from Mother Teresa’s Missionaries of Charity) walked quietly through the streets at their annual procession. If peace has a smell, it’s most certainly that of starched cotton. 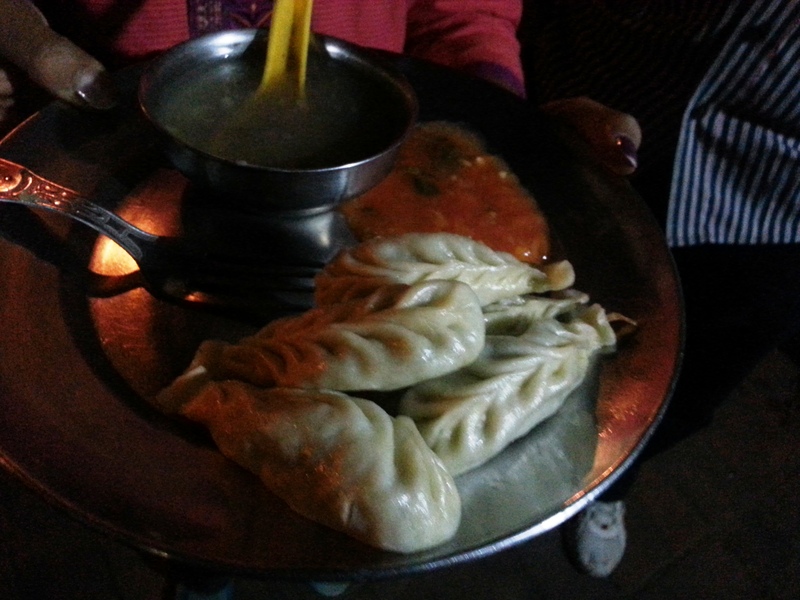 Nepalese momos – Calcutta’s street surprise! This city can start feeling like home in a few days. The Albanian Saint Teresa stayed back in Kolkata for many years and so have people from various other countries. The intermingling of different tongues has also brought about a revolution in the Bengali food circuit with the introduction of many cuisines. The momos, every other Bengali’s favourite, are actually from Nepal. For only 20 rupees a plate, these momos are a steal! The stuffed, steamed dumplings come with a spicy dip and a bowl of piping hot soup. I take one long whiff of this street food and my brain instantly declares Chinese! But I bite into a tender momo and know this is definitely not Chinese. 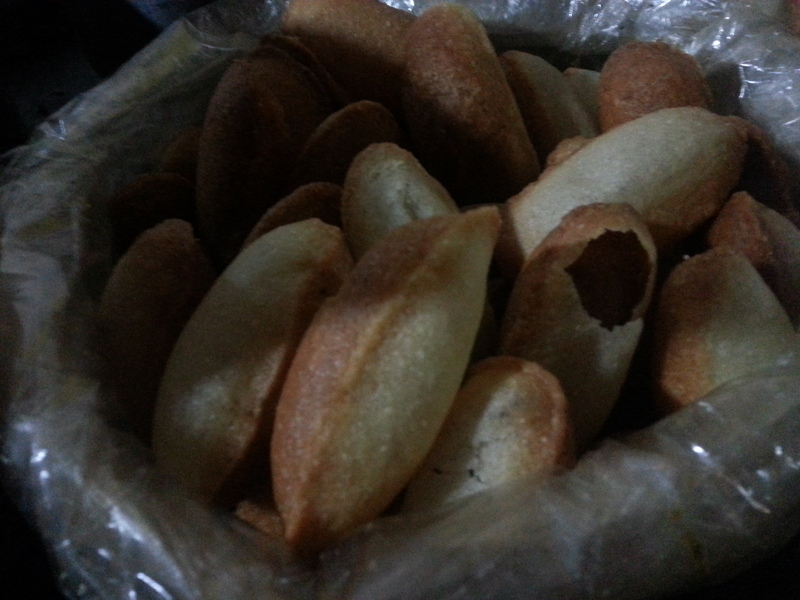 Once enamoured by a street-snack, I can’t help but dig into some more. I reach a puchka-stall and order a round of serving. The ellipsoid puris are like nothing I’ve seen before! These flour-crisps are bigger and longer than the regular spherical puris one sees in the rest of India. The smell of tamarind in the puchka-water makes me ask for another round of puchkas! 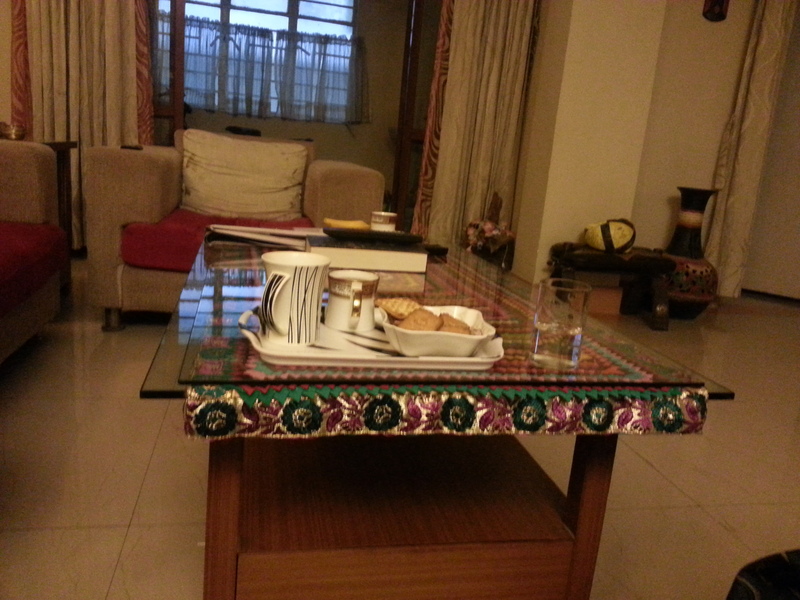 Ever been invited for tea at a Bengali’s? Eating in Kolkata doesn’t only happen outside. In fact, it mostly happens in the homes of the locals. The snack-spread in Bengal is slightly different from the elaborate lunches and dinners. Tea time is an intimate moment of reflection and discussion on all matters that affect the world. Friendships are forged over the aromatic Darjeeling tea or the malty Assam tea with some sugar-coated biscuits on the side. Bengalis drink tea like a European would wine. Tea is first tasted with the eyes as one discerns whether the colour is strong or translucent. The teacup is then brought to the nose to appreciate its aroma. It is finally sipped and gulped with some knowledge of the flavour. I can distinctly smell Kolkata when I close my eyes, every fragrance becoming clear to me. Do you ever notice the smell of a new place? Has any place left a scent in your soul? This entry was tagged Bengal, Bengali cuisine, Bengali Culture, Bengali Food, Calcutta, East India, Fragrance, India, Indian cuisine, Kolkata, Scent, Travel Inspiration, Traveling in Kolkata, Travelling in Asia, West Bengal. Bookmark the permalink. Oh..a beautifully scented and delicious post as well… khub bhalo laaglo Oindrila.. 🙂 best of luck..
Whoa, you are making me go hungry! Kolkata is indeed the best place for any food addict who thrives on smell of the eatery for their appetite. Kudos for writing such a great blogpost. Thank you, Janak! 🙂 Kolkata is indeed a foodie’s paradise! ”Kolkata feeds not just your body but also your mind.” – beautiful and great post. Good One. But I think u missed to mention ‘Rasgola’ the sweet dish. Vibrant city of joy, delighted to have your Bengali tint on an international blog. The puchka’s photograph is not of Bengali Phuchka… The photograph is of Suji Golgappa( Long elongated) which is found in Delhi. Kolkata’s puchka are mainly made of atta/maida and are round in shape. Thank you, Anindita! 🙂 I can’t wait to go to Kolkata again next month and explore more of my city! Your article is vary short and nice. I am also from kolkata. I have an article about darjeeling and kurseong on my blog.. Please check and share your views. “Kurseong Darjeeling Sevoke [Bengal safari] tour and sightseeing”.